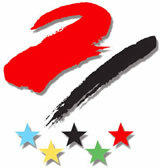 The emblem is in the shape of "U" composed of the numeral "21", representing the 21st Universiade. The powerful outline of the emblem radiates a kinetic energy, symbolizing the Olympic spirit of " Higher, Faster, Stronger". The emblem flutters like a colorful ribbon, reflecting the warm welcome Chinese people offer the athletes from all over the world. The overall design delivers the subtle appeal of Chinese calligraphy. The design of the emblem fully contains the spiritual charm of the Chinese calligraphy, embodies the cultural foundations of China with 5000-year-history, and stresses the traditional Chinese feature. The Yangtze crocodile is one of China's most treasured animals. It is named "Lala", meaning "cheer on". The Crocodile, the living fossil, symbolizes China's march into the new century. An active, lovely, humorous and friendly cartoon character that is full of adolescence is created by the means of personification. It shows the vigor of the confident, diligent and challenging Chinese colleges students. "Lala" welcomes the friends from all over the world with its lovely smiling figure.